We’d love your help. Let us know what’s wrong with this preview of Daisies & Devin by Kelsey Kingsley. And my dream became her l Every story has a hero. To ask other readers questions about Daisies & Devin, please sign up. 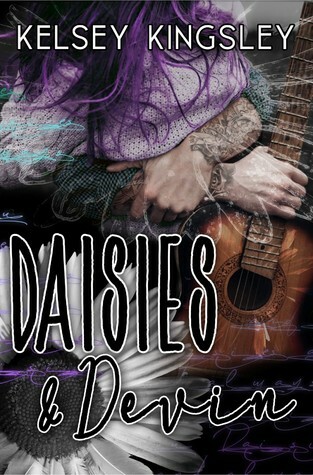 When I first read the blurb for Daisies and Devin, I thought it would be a gritty, sad rock star romance full of angst. I was mostly wrong in that assumption. There is a bit of angst, but from the moment you meet Devin and Kylie, you know they are meant to be. Don't get me wrong, during their journey, there's also some sadness, but what comes through most is a feeling of hope and the strength of the love they have for one another. Devin rescues Kylie from a pushy guy at a party, and thus, begins When I first read the blurb for Daisies and Devin, I thought it would be a gritty, sad rock star romance full of angst. I was mostly wrong in that assumption. There is a bit of angst, but from the moment you meet Devin and Kylie, you know they are meant to be. Don't get me wrong, during their journey, there's also some sadness, but what comes through most is a feeling of hope and the strength of the love they have for one another. Devin rescues Kylie from a pushy guy at a party, and thus, begins their epic friendship. However, things might have turned out differently that night if Kylie hadn't friend zoned Devin so hard right out of the gate. Enamored with her the second he saw her, he was interested in much more than just her friendship. Rather than lose her, he chose to play any role she would give him in her life... even if it tortured him every step of the way. Fast forward several years into the future, and Devin is still taking what he can get from Kylie while keeping his true feelings hidden. Kylie has feelings for him too, but she doesn't want to acknowledge them. They both date other people until the day, one of them has enough. Feelings are revealed, and both of their lives change forever. Daisies and Devin by Kelsey Kingsley is a sweet best friends to lovers romance with one of the most devoted heroes I've ever encountered. If you know me well, you know "sweet" isn't usually my thing, but I enjoyed this story despite that. Kelsey's writing is excellent as always, and I flew through the book in no time. The connection and emotion between Devin and Kylie could be felt from chapter one, and I was rooting for them from that point on. That's one thing you can always be sure of with this author: strong emotional connection between the characters. She excels at it, and it's one of the reasons I won't hesitate to one-click any of her books. Even if it's not something I would normally pick up, she makes me feel something, and isn't that what we all want from every book we read? The book starts in 2006. Kylie is in her last year of college. Her dream - hers and her dad's - has always been to open a Café with amazing drinks and poetry readings and singer/songwriters serenading the guests. But her dad is also her biggest problem. He's a drug addict and he just can't stay clean. Kylie and her mom have sent him to rehab so often but it never sticks and Kylie just can't deal with loving and hating him at the same time. She meets him at a party - a year before the book starts, but we go back and forth in time in the beginning of the story. Devin is two years older than her and he never went to college. He works for his dad's construction company. He loves it. Makes good money. But he dreams of making a living with his music. He's an amazing singer, guitar player and songwriter - and Kylie loves it when he sings to her. But Kylie also doesn't want any romantic relations at the moments - she just can't deal with that on top of worrying about her dad. Devin tries to be patient. Hoping for more than being her best friend - but if that's what he'll always be - he'll take it. He's been madly in love with her since he saw her at that party. He just wants to be in her life. What will happen with Kylie & Devin?? Will they find their Happily Ever After?? This was such a ... HUGE and ... HEAVY ... book. I adored it. But it also kinda broke my heart. Several times. It has this melancholy mood throughout ... but also this hopeful young adult mood at first. We sooo hope that Kylie and Devin will survive everything life throws at them. We need them to get that happy end. But we love every single page of that journey. Sweet, funny, heartbreaking. With lots of music and feelings and poems and waiting and so much love. I just fell for those two immediately. Even though I wanted to shake some sense into Kylie a few times. To get out of that depression and fight for her guy. And for Devin to fight harder. Ugh. This book is really hard on the reader's heart! But it's so worth it! BUT still - it was an amazing book - and amazing love story. I had to put down my kindle a few times and go do other things. I was just way too afraid of what might happen to those two along the way. The only things I didn't love other than the huge amount of wasted time.... I don't like cats and I'm not a fan of tattoos (especially on a girl - sorry - no offense to the author and other tatted girls, it's just my personal opinion. I know I'm weird! )☺ But it didn't bother me much. I still adored Kylie and Devin. I grrrrrrr .... I just wanted them to fight harder for each other. But I guess they were just too afraid to lose the other completely. Ok, enough! I LOVED the story and I need Netflix to come and make something out of this asap! Oh Devin! Daisies & Devin is an amazing read that drew me in right away. I absolutely love Kylie and Devin’s story and could not put this book down because I had to find out what was going to happen to them. I can’t wait to read more books from Kelsey Kingsley. Another friends to lovers story. They stay friends for so many years while dating others although they have feelings for each other. I decided this is a trope I don't like. Have you ever sat and asked yourself: why do I like to read? I can easily answer that question: because of authors like Ms. Kingsley. She is able to take two dimensional characters and give them life, give them purpose and give the reader all the emotions. Daisies & Devin gave all that to me and more. Happenstance brought Kylie and Devin together to form a bond that transcended years of various “relationships”, life changes, heartache and sorrow to come out of the other side to find a life t Have you ever sat and asked yourself: why do I like to read? Daisies & Devin gave all that to me and more. Happenstance brought Kylie and Devin together to form a bond that transcended years of various “relationships”, life changes, heartache and sorrow to come out of the other side to find a life the two of them never expected they deserved or would ever happen. I experienced every emotion that both Kylie and Devin lived with, their ups and downs.....for me, to have cried (which I did) and then to have had smile of pure joy a few pages later.....that is a book that warrants 10 stars, so even though the limit to give is 5, Daisies and Devin gets 10 stars! Did you ever start a book and know immediately you were going to love the story? This book was that for me. The prologue captured my heart and I knew this was not going to be an easy read. Don’t get me wrong it’s not mind boggling or difficult to figure out what’s happening. I just knew this is going to pull at all my heartstrings. I was right it did. It dealt with some very real and current problems. Usually in a story the hero or heroine meets their soulmate and at least one of them immediately Did you ever start a book and know immediately you were going to love the story? This book was that for me. The prologue captured my heart and I knew this was not going to be an easy read. Don’t get me wrong it’s not mind boggling or difficult to figure out what’s happening. I just knew this is going to pull at all my heartstrings. I was right it did. It dealt with some very real and current problems. Usually in a story the hero or heroine meets their soulmate and at least one of them immediately knows it. In this case both parties have a case of maybe this is the person for me, but I don’t want to mess this up, so we can spend our lives looking for someone to take your place, cause your friendship is worth everything to me. Yup that’s a long run on sentence but it relays so much. Yes, there were times I wanted to swat them both upside their heads. You know what though, this is how real life works. We are afraid to rock the boat, afraid to step outside our comfort zones. We decide what we think is the truth instead of actually communicating with the other person. People become mind readers, or so they think. Guess what? Usually it’s not what we think. Of course this is what happened. Kylie, is such a tortured beautiful soul inside and out. She has demons she lives with everyday. With everything she has going on in her life she is still kind, loving, loves Edgar Allan Poe and is real and lives in fear of what could happen. Devin is the boyfriend we all want. He’s a musician, romantic, poetic, soulful and loves John Mayer. Every girl wants to make him theirs for ever and ever. He’s not into relationships. Of course this sounds normal, except for Kylie, who he is desperate for but scared to rock the boat. He would move heaven, earth and hell for her. He’d even give up on his dreams. If you’ve ever heard the term, “Can’t see the forest for the trees”, this is both of them. They are blinded by their own insecurities and love. I don’t want to give away any spoilers but the book gets intense. Kylie has to worry about the cliches of rock and roll life, while Devin has to decide if she’s pushing him and not being trusting enough. I read this in one sitting cause I couldn’t stop, even though I could’ve used a breather. I had to see what was going to happen. It brought all the feels you could ask for, smiles, anger, angst, tears, laughter, romance, heat and even an education in poetry and beautiful memories of music and flowers. There’s great secondary characters and we even get to meet up with familiar people we know from other stories. First of all I would just like to say that this is Kelsey Kingsley's best book to date. I loved the Kinney brothers but Devin wow he just blew them all out of the park! This book was insanely amazing, honestly a friends to lovers romance that I could read over and over again and never get tired of. It had a lot of my favorite things in it, to name some: musician, a beautiful meaningful friendship, slow burn, all the angst and just two amazing main characters... the side characters were pretty great too. I believe there wasn't a thing in this book that I did not enjoy, not even on the times that it physically hurt to read. It was truly a beautiful love story that truly depicted that sometimes it is all about the right timing. These two were always there for each other even when it hurt to do so. Devin, oh my goodness. He was the best, always choosing what was best for Kylie even when it wasn't what was best for him nor what he wanted. He was loyal to her to a fault, he did everything for her and it was both beautiful and sad. It had been years of helping her go through life and making her dreams come true while his stood on the back burner. But when his time finally came, she was there for him too even if that meant that in order to help him live his dream she couldn't be there at all. These two met one night in college and have been best friends ever since. Kylie wasn't interested in a relationship at the time so Devin was put in the friend zone but he was willing to be her friend if he could get to know her better. They just connected in every since and since that moment their friendship was the most special thing they had. They were everything to each other. Each other's solace, safe haven and whole heart. But that last part was kept secret for their whole friendship and for half their lives, until one of them decided to finally go for it. Once they finally confessed their feeling for one another, it was like everything else that wasn't right fell into place. Devin finally got a chance at his dream. And the perfect little bubble they had been living in finally burst, a lot comes with living a life in the public eye and being a rock star and Devin got a bit lost in it all. Their relationship was put through the test and Kylie was willing to let Devin go if that meant that he got a chance of really living his dream without her holding him back but is Devin really willing to give up the love of his life to live his dream? Daisies & Devin was truly a beautiful and real story about all the life struggles a person goes through... friendships, relationships, dreams, losses, grief, love...The writing was phenomenal and this story will be one that will stay with me for a while. I just loved it so much. It made me feel a lot and just made me think about my life and what comes next for me. Anyway, it was an amazing read and you honestly need this book in your life! ➳ARC kindly provided by Kelsey, in exchange for an honest review. 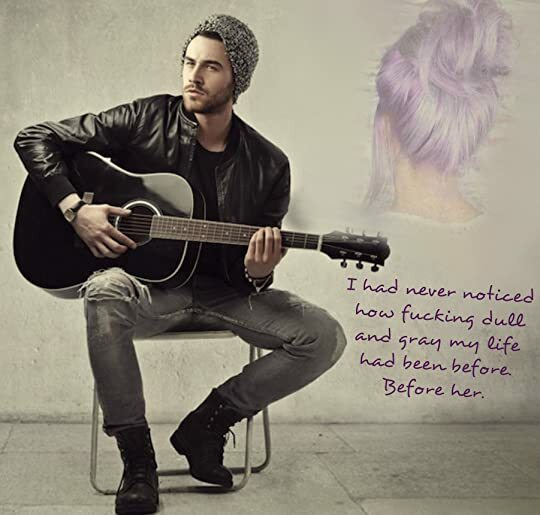 I've always said rock star romance is my kryptonite within the romance genre- a nice easy read, troubled rock star falls for groupie type book, but this is not your average rock star romance. It's so much more. I'm pretty hard hearted when it comes to books. It takes a lot for a writer to elicit an emotional response from me. I NEVER cry at books. Until Devin! Daisies and Devin literally ripped my heart out of my chest, tore it into a million pieces, scattered those pieces across the world, then I've always said rock star romance is my kryptonite within the romance genre- a nice easy read, troubled rock star falls for groupie type book, but this is not your average rock star romance. It's so much more. I'm pretty hard hearted when it comes to books. It takes a lot for a writer to elicit an emotional response from me. I NEVER cry at books. Until Devin! Daisies and Devin literally ripped my heart out of my chest, tore it into a million pieces, scattered those pieces across the world, then went out and hunted them all down and put them back together again. I was reaching for the vodka and comfort eating pizza and ice cream the whole way through. Devin and Kylie's relationship is full of angst, heart break and sadness but also shows a bond that is tied so tight it can never be broken. They support each other through life's ups and downs in the way only best friends can, but there is always that underlying "Could we be more? Should we be more?" and you will find yourself wanting to scream with frustration, jump for joy and cry both happy and sad tears at the same time. Get the junk food and alcohol ready, you're going to need it! The fact that this book is deeply personal to the author is evident in every word and that makes each feeling it pulls from you so much more beautiful. It's real and raw and takes you through every page as though you're living the ups and downs of the character's lives with them. You absolutely MUST put aside you life and read this book but prepare yourself, Daisies and Devin gave me the book hangover to end all book hangovers! This is not an easy read, but it will be one of your favourites. Kelsey Kingsley has already shown she has talent with her previous works, but this is her best work yet. Her tour de force! This review has been hidden because it contains spoilers. To view it, click here. WARNING - My review contains some spoilers!!! Kylie and Devin meet at a Party, he saves her from a creep who won’t leave her alone and they become instant friends, best friends! He is always there for her, regardless of what happens, why is he like that?? Because he loves her, he loves everything about her! For 13 years they watch each other go out on dates, have short term relationships and he even invests in her dream of owning a coffee shop! He puts his dream of becoming a singer on hold, ev WARNING - My review contains some spoilers!!! For 13 years they watch each other go out on dates, have short term relationships and he even invests in her dream of owning a coffee shop! He puts his dream of becoming a singer on hold, even though she encourages him to go for it! They end up living together as he can’t afford to rent the apartment he lives in when he cousin moves out with his fiancé! One night, after Kylie ends things with her boyfriend, and he tells his girlfriend it’s over, Devin can’t stand it anymore and confesses his feeling for her, he finds out that she feels and has felt the same as him since they met 13 years earlier, but was afraid to tell him in case he rejected her! Once they declare their love for each other things go great, they are so happy and can’t keep their hands off each other, and then he gets his big break, which is what they have both dreamed of for years, but as everyone knows dreams don’t always end how they are meant to! Whilst on tour, Devin does the one thing that is unforgivable to Kylie, and she walks away heartbroken! They are both miserable but can they come back from the devastation and heartbreak? I just finished a story that is not only a top read for me this year but these characters have cemented themselves into my heart. I have NEVER fallen for a character so quickly, 5% in and Devin already had me. I've just finished and my emotions are in my throat. You could call this a coming of age story, a second chance romance, a rockstar romance but really it's all of those things and at the same time none of those things. What it is, is an extremely EPIC story of love, addiction, dreams, timi I just finished a story that is not only a top read for me this year but these characters have cemented themselves into my heart. I have NEVER fallen for a character so quickly, 5% in and Devin already had me. I've just finished and my emotions are in my throat. You could call this a coming of age story, a second chance romance, a rockstar romance but really it's all of those things and at the same time none of those things. What it is, is an extremely EPIC story of love, addiction, dreams, timimg, death, renewal, letting go and coming full circle. Devin and Kylie meet at a party one day during a interesting situation. Though Devin felt something at that moment, neither one of them realized just how pivotal the other would be in their lives. They soon become inseparable and the best of friends. Kylie shares her dreams of owning a coffee shop one day and Devin shares his aspiration to sing for millions.....just him and his guitar. Kylie hasn't always had the simplest life and there's a darkness surrounding her soul, when tragedy strikes she turns to her own personal hero, the man she can always depend on.....who slays her dragons and wipes her tears. The only one who can help her through this horrible time and give her peace. Devin would do anything and absolutely everything for Kylie. His unselfishness is how he shows his love. Even when it means putting his goals on the back burner because without her he's not sure who he is. Our story takes a major change soon after with some extreme highs and lows. Kylie and Devin have created this bubble, this cocoon of intimacy that seemed impenetrable........I was emotionally DESTROYED in the sweetest and most romantic ways but also in devastating ways as well. I just can't get these characters and their story out of my head, Kelsey has really outdone herself with this beautiful, crazy, phenomenal book. It makes you think. Laugh. Swoon. Cry (several times) it's true artistry on paper filled with music, poetry and life. I wish I could share my highlights from this book but that would take up too many pages. GRAB DAISIES & DEVIN NOW! There are certain books that you know you are just going to love from the first page....and I mean the page before the first page. This book is one of those. This is Kelsey Kingsley's best book to date - and I knew it would be once I read her Note from the Author. She writes with such emotion and realness - her passion for her stories and characters is so apparent that you can't help but immerse yourself in their stories. This book went even deeper though. She created characters who were so raw There are certain books that you know you are just going to love from the first page....and I mean the page before the first page. This book is one of those. This is Kelsey Kingsley's best book to date - and I knew it would be once I read her Note from the Author. She writes with such emotion and realness - her passion for her stories and characters is so apparent that you can't help but immerse yourself in their stories. This book went even deeper though. She created characters who were so raw and real that I had the biggest book hangover when I finished their story. I just simply didn't want it to end. The Prologue sets the tone for Kylie's life experiences, and you know from the start that it's going to be an emotional ride. Kylie has endured a tough life with her dad being an addict, yet she still holds onto her unconditional love for him. She is so loyal and compassionate; she's fierce and independent; and she is beautiful. When Devin first spots Kylie, he describes her as only a poet would - he is completely enamored by her, and of course her purple hair. It is apparent that Devin is unique from other guys in the way he studies her from afar, swoops in to save her, and then proceeds to serenade her under the stars - all while playing the cool, laid back guy who seems not to have a care in the world. I fell for Devin. Hard. He is talented, passionate, devoted, hard-working, and would do anything in his power for the girl he believes is his soulmate - even if that means remaining best friends. I wanted to scream at him many times; but as their story unfolds, you realize that timing and basically just "growing up" can change everything in a relationship. "I stared at you for twenty minutes at that party, before I had no choice but to rescue you," he said so plainly. "From ten feet away, I thought you were the most beautiful thing I had ever seen. And up close, I realized you weren't just beautiful. Beautiful is only one word, and there are hundreds to describe you. I should know - I've spent years stringing them all together." SWOOOOOOON! I high-lighted so many quotes in this book because they are just beautiful, and touching, and meaningful. Devin is so selfless that he literally brought me to tears at times. His love for Kylie is endless, and of course poetic. "The one. The one that would change my life, the one who would need me to change hers." Wow- I don't even know what to write. I have tried to write this review so many times, but it has taken me a while to get all of my thoughts in order. But holy wow. This is so much more than just a book. It's a whole life span. It's a story- it's the reason I love reading long books. Kelsey has managed to string every emotion out of me- happiness and smiles, tears, anger, scared, and heartfelt joy.. I was re "The one. The one that would change my life, the one who would need me to change hers." This is so much more than just a book. It's a whole life span. It's a story- it's the reason I love reading long books. Kelsey has managed to string every emotion out of me- happiness and smiles, tears, anger, scared, and heartfelt joy.. I was reminded so many times while reading this book of WHY I love reading, why I love getting lost in a fictional world and falling head over heels in love. This book makes you believe in love. It reminds you of all the twists and turns love pulls you through. This book starts at the beginning. It starts with the base of their relationship- the friendships, works its way throughout those awkward years of unrequited love, and then slowly weaves back into real relationship lane and leads you down a path of heartbreak and redemption. Devin and Kylie were always friends. From the moment they met, they just weren't ready. But it doesn't mean that the next 15 years needed to be skipped over. I loved getting to know all the details of their lives. I loved getting to know these characters. When the day finally comes for Kylie and Devin to be together I could not have been happier. Air high fives were given (to myself) because while I did enjoy reading from the beginning, I knew this was going to be the good stuff- and it totally was. The pre ending made me of course want to pull my heart out and scream. But the ending brought my anger down enough to soothe me over until the final ending. This book is the reason I read romance novels. Was it long, yes. Could there have been parts left out? Maybe. But I really feel like it would have taken away from the book. This book was jam packed- with music, with poetry, with art, with love. You can tell this book was one of those books an author poured her soul into. It did take me a few days to finish because of the length, but I really encourage you to get through it. There were so many surprises, so many twists and turns that I literally was along for the ride and enjoying every minute of it. I really do believe this is one of the best books I have read by Kelsey and you can really tell a maturity in her writing with this book. 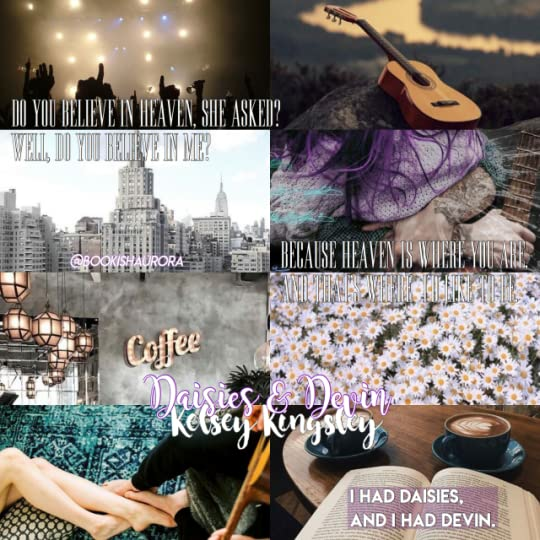 Daisies & Devin by Kelsey Kingsley is a sweet, slow-burn, friends to lovers, contemporary romance told in dual POV with loveable and well-developed characters. Kylie and Devin meet at a party when he steps in and rescues her from a guy who won't leave her alone. They connect right away and have an immediate attraction, but due to certain circumstances, Kylie isn't looking for anything more than friendship. Due to being friend-zoned from day one, Devin ends up becoming her best friend. The st Daisies & Devin by Kelsey Kingsley is a sweet, slow-burn, friends to lovers, contemporary romance told in dual POV with loveable and well-developed characters. The story follows Kylie and Devin's relationship over the course of 13 years as they chase their dreams, experience life's ups and downs, and struggle with their feelings. There were some heartbreaking moments that caused me to shed some tears. I deeply felt for both characters and rooted for them throughout their difficulties and uncertainty. It's a long road, but Kylie and Devin eventually do find their HEA at the end of it all. This is a beautifully written, touching story about friendship and steadfast love. Gahhh !!! This book. This is my favorite Kelsey book to date. She wrote this book with so much depth, feeling, and you could tell the writer had such a connection to this book. Devin and Kylie meet when he rescues her at a party from an annoying persistent guy. They become best of friends. Through everything, good, bad everything, they’re there for each other. Years go by, Devin keeps his love for her deep down. They date other people and endure each other's dating choices, but when they finally Gahhh !!! This book. This is my favorite Kelsey book to date. She wrote this book with so much depth, feeling, and you could tell the writer had such a connection to this book. I lack the words to properly describe how amazing this book is. It's a must-read. Without question, it will be on my top 10 of 2018. Truly, I'm struggling to compose proper sentences that stand a chance at convincing you to read it. This book gave me feelings like the heart-twisting ache I feel every time I watch John Cusack's character stand in the rain and hold the radio above his head in "Say Anything," the life-affirming love and loss of the first 15 minutes of "Up," and the heart-soaring hop I lack the words to properly describe how amazing this book is. It's a must-read. Without question, it will be on my top 10 of 2018. This book gave me feelings like the heart-twisting ache I feel every time I watch John Cusack's character stand in the rain and hold the radio above his head in "Say Anything," the life-affirming love and loss of the first 15 minutes of "Up," and the heart-soaring hope I feel every time I root for the kid running through the airport to get to his girl in "Love Actually." At first I thought this was going to be a book about two people who just lust after one another throughout the whole story. But I was pleasantly surprised that it was much more than that. Devin is an artist with a kind soul who loves with everything within him. Kylie is focused on her goals in life but is hesitant to trust people and open up. By the end of the book it seemed I had permanent goosebumps! I definitely recommend this book, especially if you are a music or poetry lover. There is a he At first I thought this was going to be a book about two people who just lust after one another throughout the whole story. But I was pleasantly surprised that it was much more than that. Devin is an artist with a kind soul who loves with everything within him. Kylie is focused on her goals in life but is hesitant to trust people and open up. By the end of the book it seemed I had permanent goosebumps! I definitely recommend this book, especially if you are a music or poetry lover. There is a heavy music and Edgar Allan Poe presence in this book, obviously, and the way it’s written and lyrics and poetry are used at times to tell the story is really beautiful! I have read all of Kelsey’s books but this by far is her masterpiece. This book started and ended with a complete circle for Devin and Kylie. I went through so many emotions throughout the book which made me love it more. I was dreading if something was going to come along and knock those two apart. I loved seeing how their relationship changed over the years. How they grew and with them their dream grew as well. Gosh I am typing this with tears in my eyes because the ending just touched my hear I have read all of Kelsey’s books but this by far is her masterpiece. This book started and ended with a complete circle for Devin and Kylie. I went through so many emotions throughout the book which made me love it more. I was dreading if something was going to come along and knock those two apart. I loved seeing how their relationship changed over the years. How they grew and with them their dream grew as well. Gosh I am typing this with tears in my eyes because the ending just touched my heart. This review has been hidden because it contains spoilers. To view it, click here. Devin was a great boyfriend. This book ground me down for like ten years of them being best friends and it got ridiculous of them not communicating their care for each other.....I think I skipped through part 3.... Well, the Rock star thing with stupid Robbie was annoying and you could see Devin being swept away. Geez, what a heart breaker. Well, it's HEA for a lot of people in this story. It's fun! I enjoyed this one. It’s definitely a different read from Kingsley, but she does it well. I loved Devin’s character; his love for Kylie truly shines throughout the entire story, even when they were just friends. This book has all the feels: I laughed and definitely got choked up while reading. There were many things that brought a smile to my face, especially some of well-written lines delivered by both characters as well as just in their heads. First of all, this book got me back into reading. I had looked at multiple books, multiple first pages and just didn't have the energy or the mindset to read but the second I got the arc of this book, I knew it would get me out of my slump. This book was a sweet read. It was really long at some points, but I always wanted to know what else would happen. Thanking Kelsey for bringing me out of my slump! DNF at 23%. Not really diggin Kylie, too many time skips, 9 years already and still just friends? Sorry but no. Just not in the mood for unrequited, no communication, slow burn love. Since the first day Devin met Kylie, he was in love with her. Unfortunately, 9 years later, he still loves her and she still keeps Devin in the friendship zone. But Devin realizes that their friendship is too important to risk. What he doesn’t know, is Kylie feels exactly the same way! In the 9 year span since the beginning of their “friendship”, Devin does everything for Kylie, including ensuring Kylie’s dreams come true while putting his own on a back burner. And during all thi Unrequited Love! In the 9 year span since the beginning of their “friendship”, Devin does everything for Kylie, including ensuring Kylie’s dreams come true while putting his own on a back burner. And during all this time, he never lets Kylie see how he truly loves her. I was frustrated with Kylie’s personality (selfish, dramatic, whiny) and equally as frustrated with how Devin acts like a bit of a doormat (although a romantic, swoony doormat). I enjoyed the book, although it wasn’t my favourite from Kelsey Kingsley. It is well written and you do get drawn in to hoping Devin finds his HEA. Personally, I think Kylie is still very immature and I found I didn’t really like her. I’m just going to start by saying, THIS was by far my most favorite read by Kelsey Kingsley. Talk about all of the feelings, like every-single-one-of-them. Daisies & Devin took me took me on a journey of love, loss, forgiveness, music & lyrics, poetry, some tears, and lots and lots of daisies. And you know what? I loved every minute of it. D&D is a book I just made room for in my heart, and I plan to keep it there for a very long time. 5 ‘Black & Brewery’ stars! To start off I just have to talk about how amazing this cover is. That's one thing I love about this author, her covers are so unique. After reading Daises & Devin this cover fits the book even better. At the beginning of the book we meet Kylie. Her dream is to open up her own diner (not sure if that's the right word for it, haha). Kylie's father shares her dream and she hopes to start when she graduates. Devin hasn't gone to college and works for his father's constructions company. He is hap To start off I just have to talk about how amazing this cover is. That's one thing I love about this author, her covers are so unique. After reading Daises & Devin this cover fits the book even better. At the beginning of the book we meet Kylie. Her dream is to open up her own diner (not sure if that's the right word for it, haha). Kylie's father shares her dream and she hopes to start when she graduates. Devin hasn't gone to college and works for his father's constructions company. He is happy with his life, but his passion is music. Kylie meets Devin at a party and there is an instant connection. They become the best of friends and Devin is there for Kyle when she has some hard times. I don't want to say too much, because this is a book you just really need to experience. In Daisies & Devin we read about the few years they know each other before it's here and now. I loved this. Even though there were some heartbreaking moments, it added so much to this story. Kelsey Kingsley makes you fall in love with these characters and only want them to get their happily ever after. Kylie deals with some hard things with her father and I can't imagine that was easy to write about. Even though they don't date, it's clear there are so many feelings there. I think both of them are really just afraid to lose the other and end up with nothing. This really frustrated me at times. I just wanted to smack them and say to them they needed to admit how they feel. Kylie loves Devin and the other way around. They take care of each other and even get a cat. As a cat lover, I was so happy when they got the cat. I also love the fact that Kylie loves books! That makes my book loving heart very happy. On top of all of that, I love the poems in this book and the song lyrics. They add so much to the story. I was so happy we got to see a character from one of her other books. When I was a wee lassie, I was told by my preschool teachers that I was a natural at storytelling. When I was just a little older than that, an old friend's mother said to me, "Kelsey, one day your books are going to be on the shelves at the library." Well, Diane, I don't know if my books are ever going to be on the shelves of libraries, but I'm sure as hell going to try. When I'm not writing stor When I was a wee lassie, I was told by my preschool teachers that I was a natural at storytelling. When I was just a little older than that, an old friend's mother said to me, "Kelsey, one day your books are going to be on the shelves at the library." When I'm not writing stories destined to be bestsellers, I enjoy devouring TV shows, listening to every type of music there is and going to concerts, reading pretty much anything (with a soft spot for romance and certain books located in 18th century Scotland), obsessing over makeup, and pretending to workout.